People always ask this question and there are a thousands answers around the web. 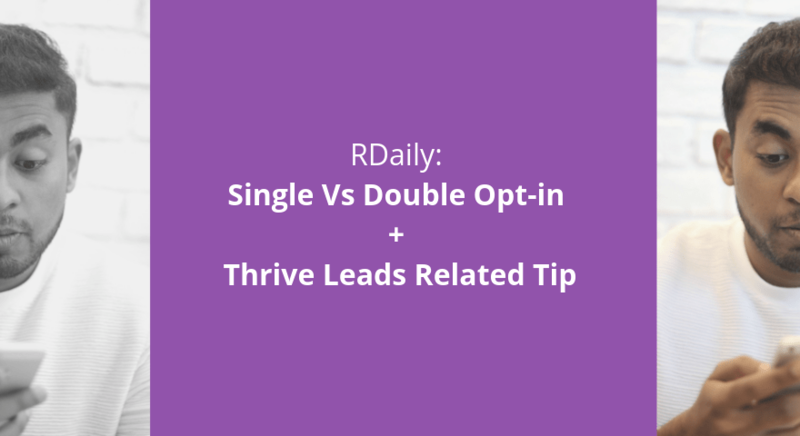 So how do you decide between single vs double opt-in for your newsletter signups? My default rule is to always go for double opt-in. I’m a big believer of quality over quantity. Double opt-in ensures high quality readers who really want to be on your list. It validates that your lead magnet is high quality too. Higher % open and click rates, engaged readers and finally and most importantly – lower spam. This means the people who don’t like your material, don’t spoil it for the ones who do. That being said there are few cases there you might want to consider single opt-in. After the readers have had good engagement with your product/service/brand. Like during a e-commerce checkout, donation payment. Its okay to simply make them check a box to opt-in for newsletter. If for some reason you cannot provide a lead magnet or compelling reason to get on the newsletter while convincing them to double opt-in. But you feel they will convert over emails. Ideally I would ask you to find your best performing email and use that as the lead magnet or public material to connect and build trust. If you are a email marketing advanced master ninja samurai rockstar janitor, who is looking to squeeze the maximum revenue for your business, go for single opt-in. Ultimately single opt-in does mean higher/faster growth (as it includes people who would have double-opted along with the ones who single-opted). But its not for beginners/intermediates. So for me, double opt-in is also used as a yard stick to measure if what we are doing is working. A method to validate the quality of our lead magnet and the copy written. If you connect and build trust properly, no matter what, people will find a way to get on your list – Me. Many people who use double opt-in find it convenient to use this option. I am talking about the post opt-in confirmation action called success notification. Thrive themes usually gets stuff like this right, but this isn’t one of them. Check screenshots which explain the recommended step of using switch state. This is a great tip! Thanks. I wanted to take them to a nice thank you page I have a template for but I can’t figure out how to make that close.